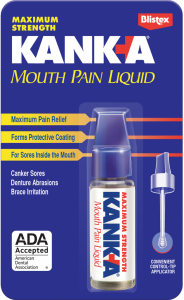 Kank-A® offers a full line of products designed to provide solutions tailored to specific oral pain needs. Each product offers maximum strength benzocaine to ease pain plus unique formulas and application systems that deliver relief the best way for each type of sore. Maximum strength stops pain fast. For canker sores, film-formers seal in medication and seal out irritants. To precisely place medication where it’s needed, Kank-A Liquid has a built-in applicator…no need for swabs or messy fingers. Maximum strength stops pain on contact. 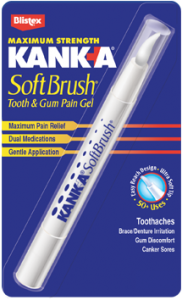 For tooth and gum pain, Kank-A Softbrush combines two analgesics for dual relief. To apply a measured dose of medication to gums and between teeth, Kank-A Softbrush has a comfortable brush tip.